end all / be all lab, if you have any suggestions, I'd like to hear them. could be made. Additionally, all hosts and VMs are running 64 bit OSes. 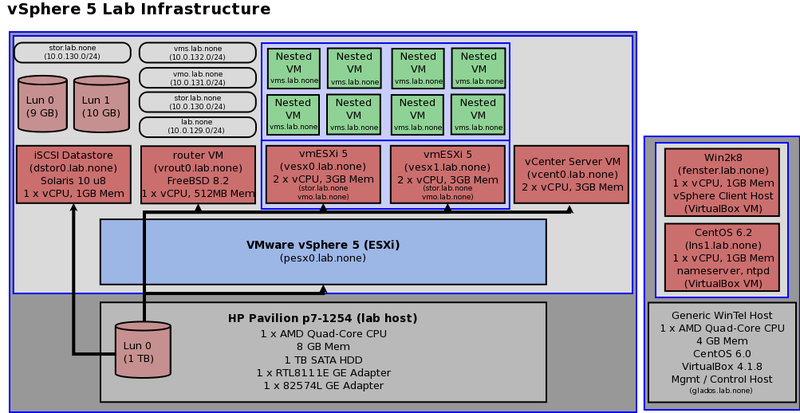 (the vSphere lab host) with VMware ESXi 5 directly installed (pesx0). thin provisioned storage, minimal system resources, and no OS installed. lab testing, however, it would never beat a performance benchmark. the above setup would see quite a bit of resource contention. The second physical host contains 2 additional, critical components. connected via a crossover cable to the vSphere lab host's 82574L GE NIC. the second physical host (management host) and its VMs will be discussed. the MTU to 8106 to reflect the actual configuration seen later. The MTU of 8106 is due to the datastore's support of that MTU size.